Tribute to those former Angels we lost this past year. 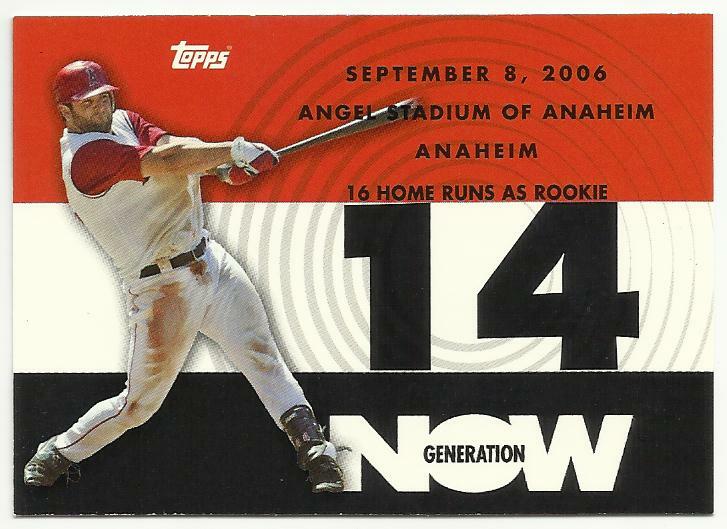 I want to collect this 2007 Topps Generation Now Mike Napoli set, hopefully through trades. I have a few cards already, here is what I need. All throughout the year my wife insists that it's going to be a small Christmas. "Let's keep it simple, the kids don't need anything, we don't really need anything. We have debt to pay off." I always heed her wisdom. Then a couple weeks before Christmas she goes into flat-out gang-buster spend mode. And I laugh and love her for it. 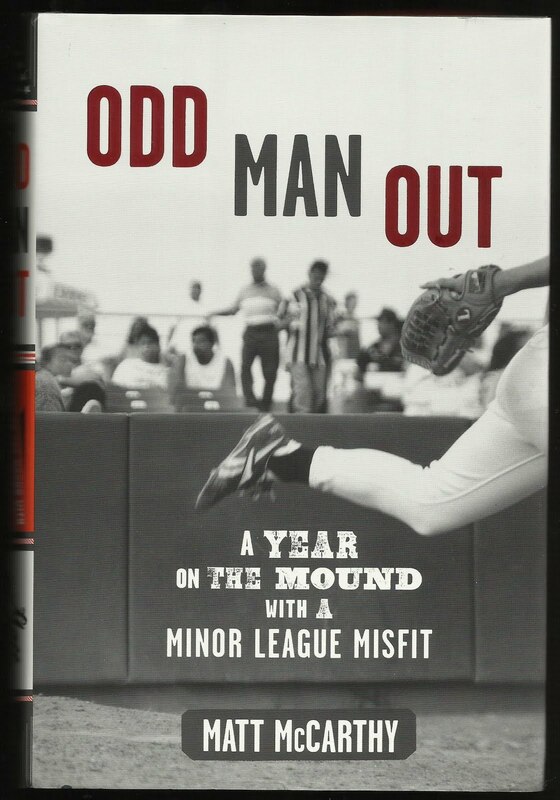 One of several books I've wanted for a long time. An Angels history book with interviews with some of the most well-known Angels. Dig that old-time Nolan Ryan picture. 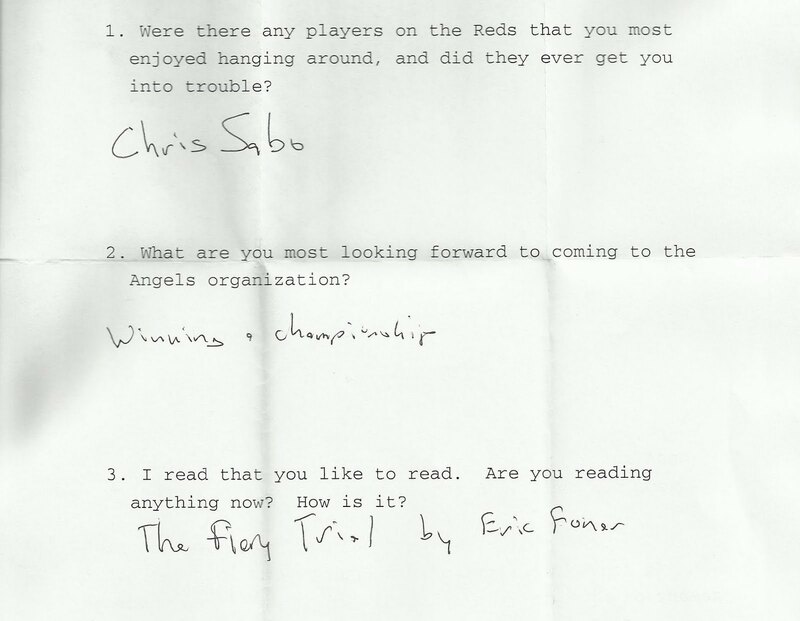 Angels minor leaguer tell-all, supposedly. I'll take this one with a grain of salt. I know that many of the "facts" in this book have been challenged and many disproved or shown to be exagerated. But it's a must for the Angels library. 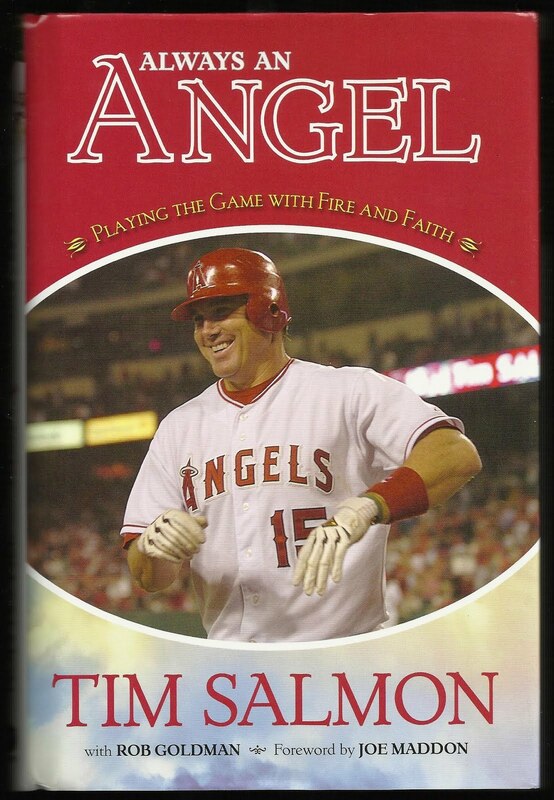 How can an Angels collector not have a book by Tim Salmon. Now I do. 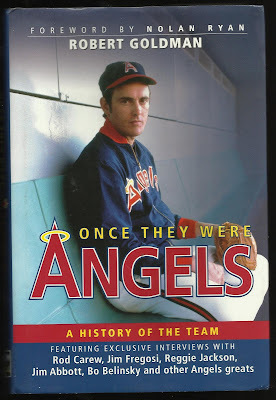 This book has had a reserved space next to my Nolan Ryan books for the last year. My two most favotorite Angels. My wife also gave me an Amazon gift card in my stocking. 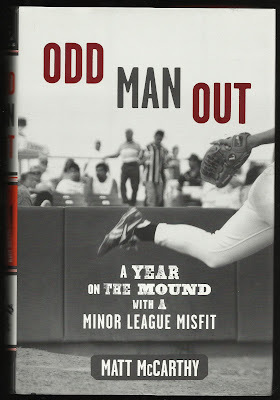 There are several other books I've had on my want list for a while. Time to see if I can get some crossed off. 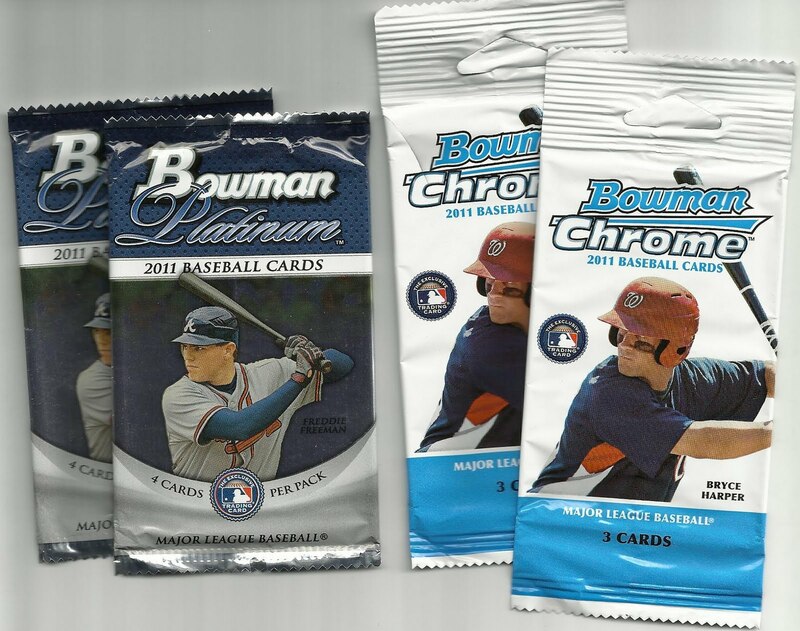 Two packs of 2011 Bowman Platinum and 2 packs of Bowman Chrome. 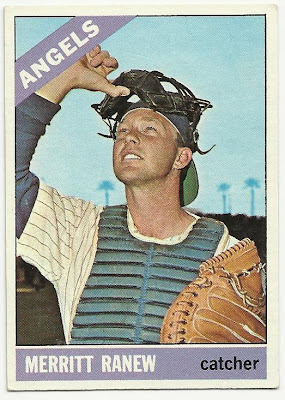 Nice cards but not a single Angel. Blaster of 2011 Bowman Draft Picks and Prospects. 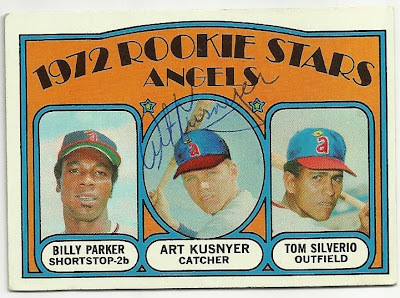 Nice cards but not a single Angel in the box. Hmmm. She did well though. 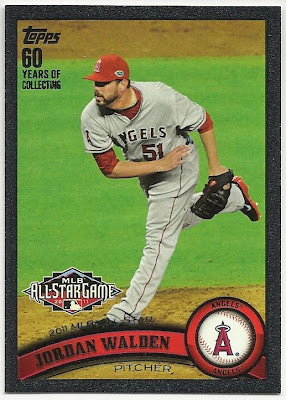 I was Toppsed-out so I put "No Topps, Bowman OK" on my Christmas list. Be looking for a trade bait post coming soon. Two books of stamps for my TTM autograph requests. Mike Napoli Rangers jersey t-shirt. Yes I actually asked for this. I go to a lot of Ranger games, and only wear my Angels gear when the Angels are in town. So I combined the 2 - Nap will always be an Angel in my heart. 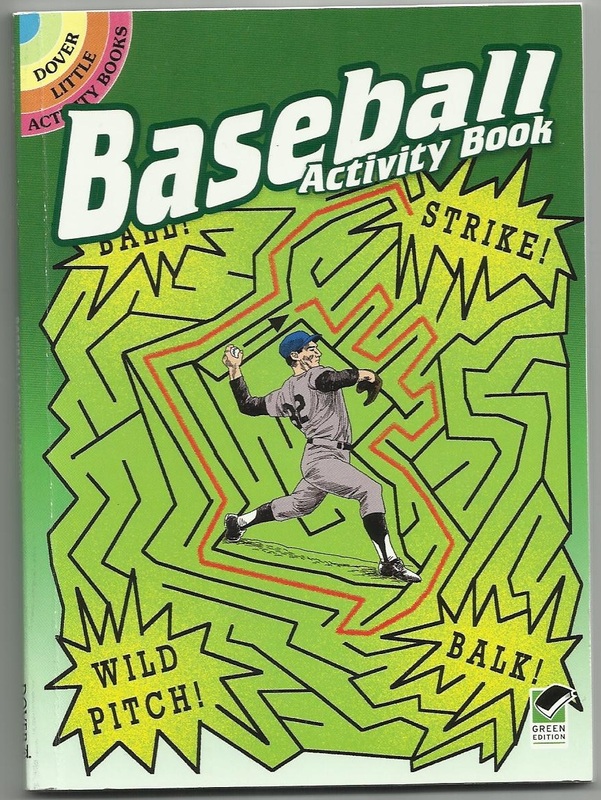 Baseball Activity Book - goes immediately to my toilet reading rack. 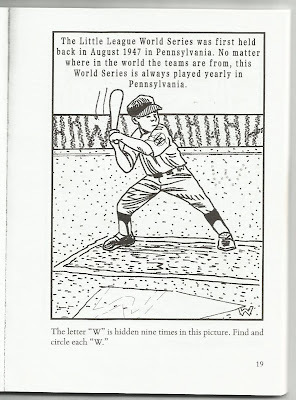 Here's a puzzle for you all before this little book gets Red Flagged! Any Football Guys Out There? House cleaning. Looking to sell this box of about 550-600 football cards. 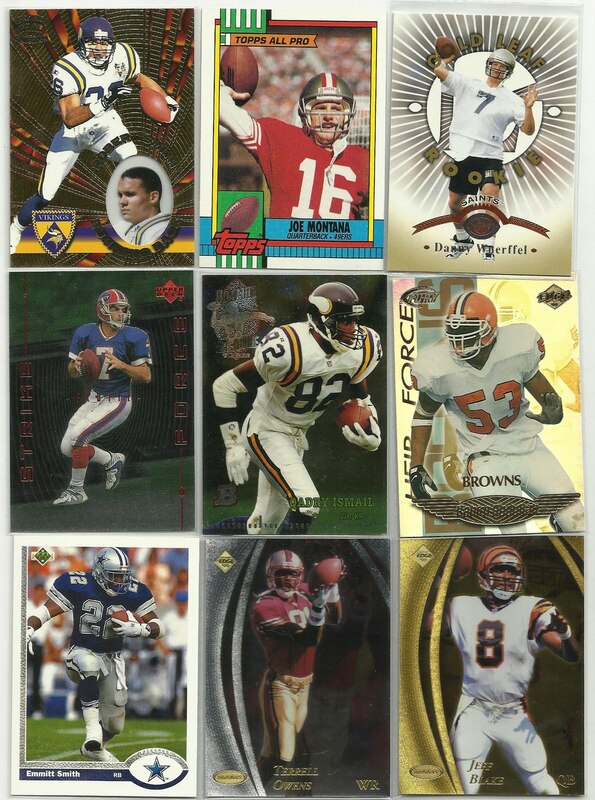 Box includes stars, rookies, parallels, numbered, SPs, chrome, foil stamped, just about everything from about 1990 - 2000. 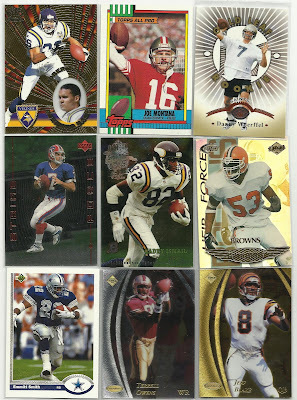 All are in excellent condition, many in penny sleeves. UPDATE: I FOUND MORE SO I'M MAKING THIS A MEDIUM PRIORITY RATE BOX FULL - PROBABLY AROUND 600-1000 CARDS. BEST OFFER PLUS SHIPPING. PM me with an offer and I'll get back to you. 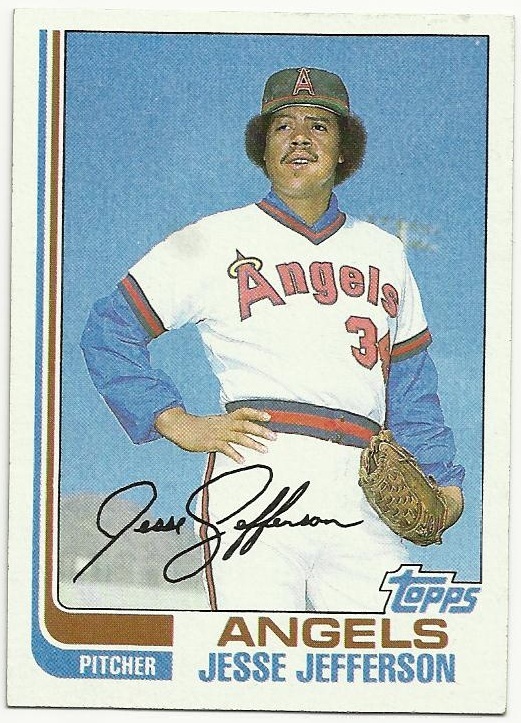 That Jeff Blake Collectors Edge Masters is numbered 131/150. 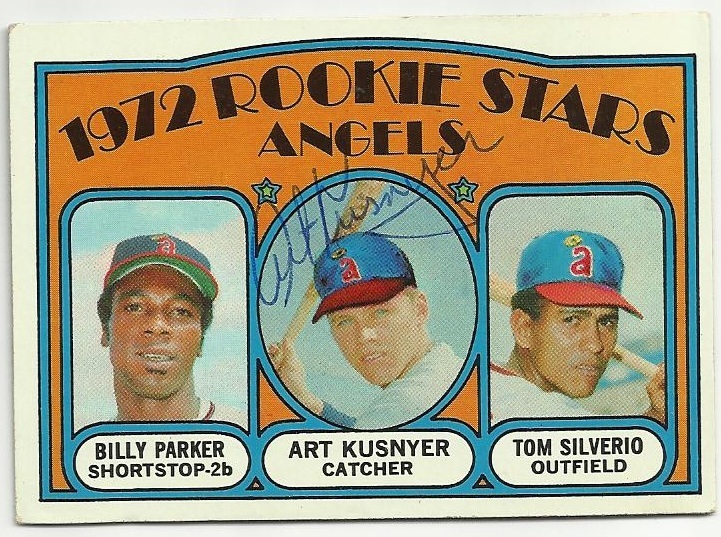 Actually all three of these Angels cards are cool. Made a trade with Ryan, from This Card is Cool, who was offering up trade bait. He had some sweet Angels to offer which I took him up on. 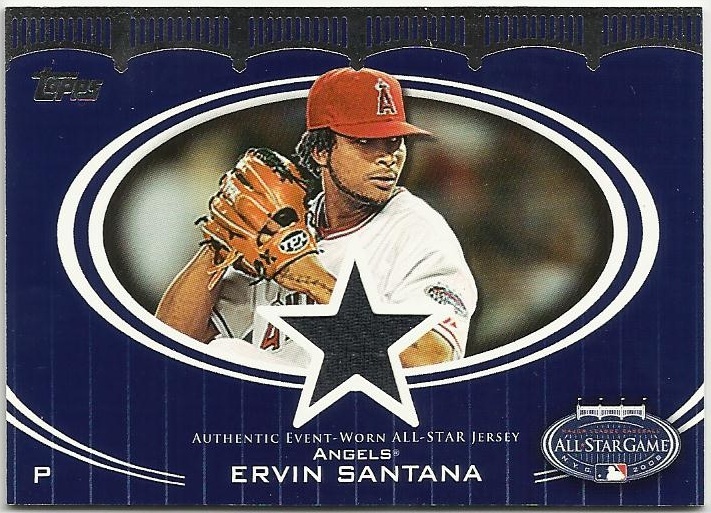 2008 Topps Update All-Star Stitches Ervin Santana AS-ES. This would be a nice team set to complete. 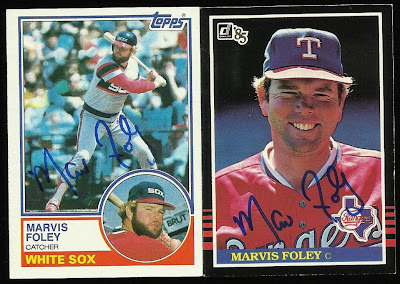 Now I just need the Saunders and K-Rod. 2011 Topps Update Black Border Parallel #US146 Jordan Walden 34/60. 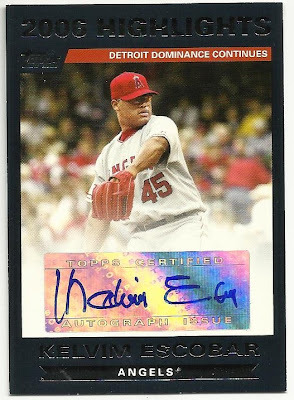 2006 Topps Highlights Authentic Autograph Kelvim Escobar HA-KE. 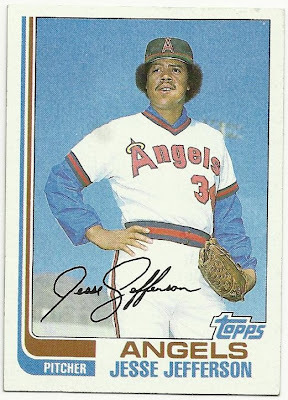 Unfortunately I have no cards for Jackie Hernandez. 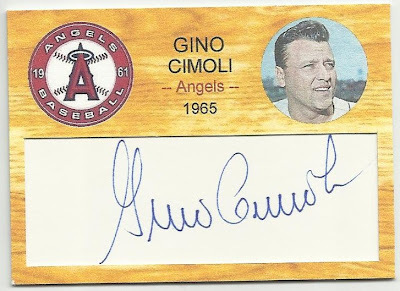 May 15, 1965: Signed as a Free Agent with the California Angels after being released by the Cleveland Indians. 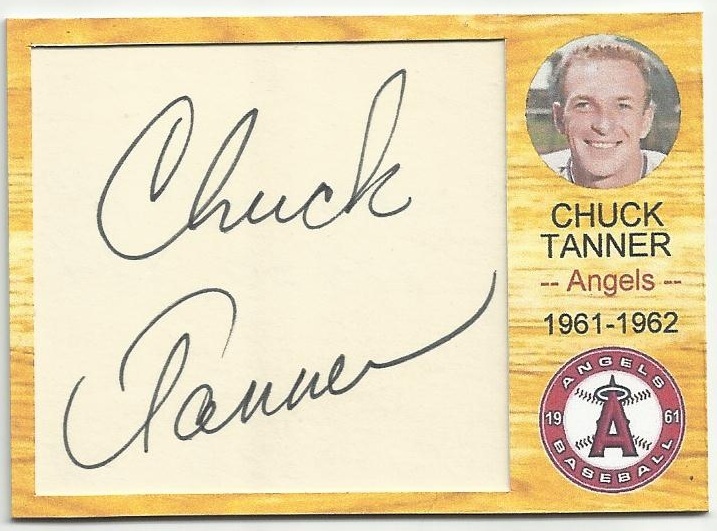 December 2, 1966: The California Angels sent a player to be named later and Dean Chance to the Minnesota Twins for Pete Cimino, Jimmie Hall and Don Mincher. 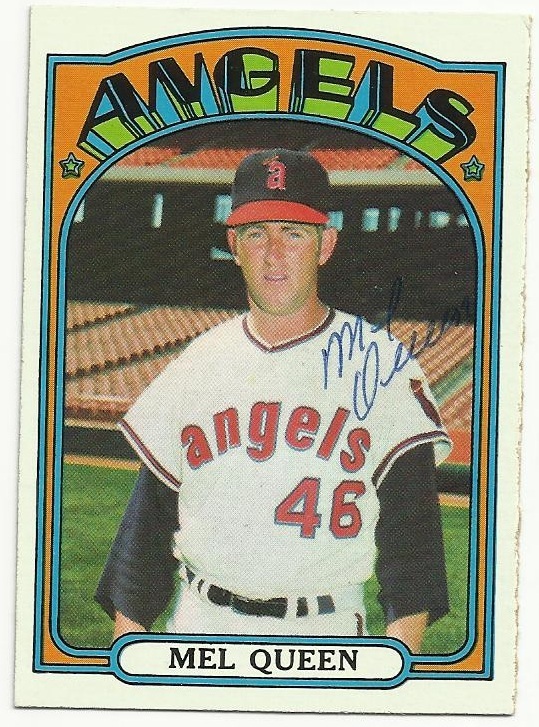 April 10, 1967: the California Angels sent Jackie Hernandez to the Minnesota Twins to complete an earlier deal made on December 2, 1966. 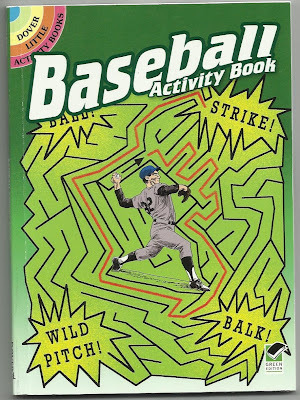 Entered the game in the 8th as a pinch runner at first base for Joe Adcock, he then stole second and went to third on a throwing error by catcher John Romano, then later scored on a Rick Reichardt single in a 7-1 win against the Chicago White Sox on Tuesday, September 14, 1965 (N) at Chavez Ravine. Was also the Debut game for future Angel Bill Voss for the White Sox. 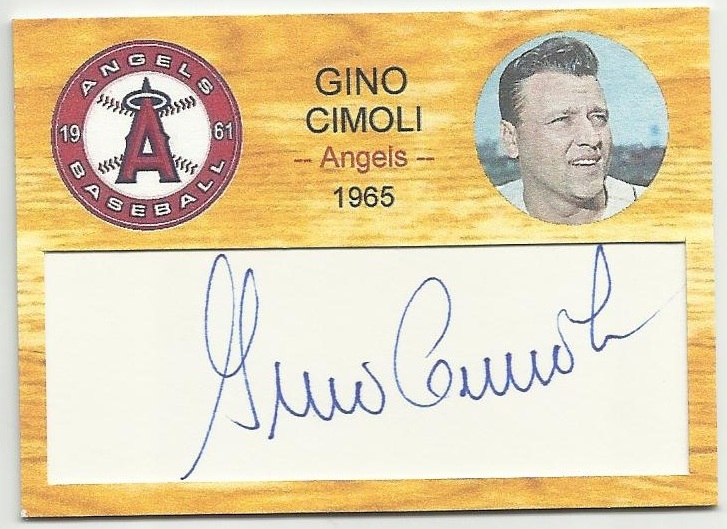 Earlier that month the Angels announced they were officially changing their names to the California Angels in anticipation of thier move to the new Anaheim Stadium for the following season. 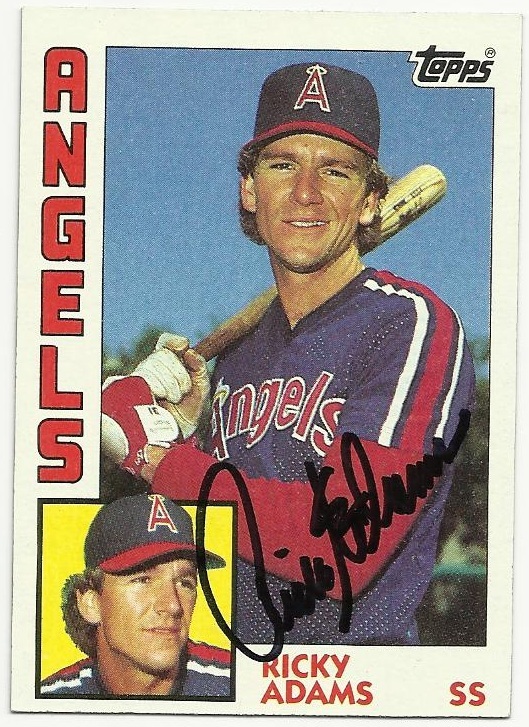 This made Jackie Hernandez debut the first debut for a California Angel. In 29 ABs hit .103 with 1 double and 3 RBI. Committed 6 errors in the field. 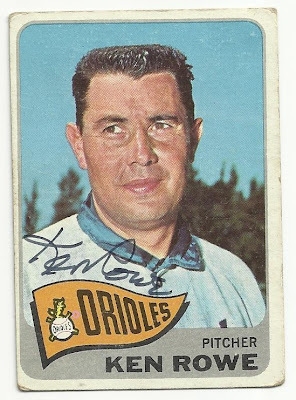 Went 2 for 2, scored a run and had an RBI in a 10-6 loss to the Orioles on Friday, September 24, 1965 (N) at Memorial Stadium. 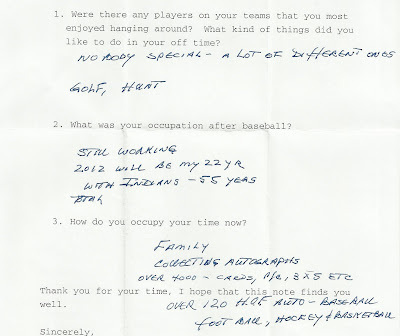 - Originally signed by the Cleveland Indians as an amateur free agent in 1961. 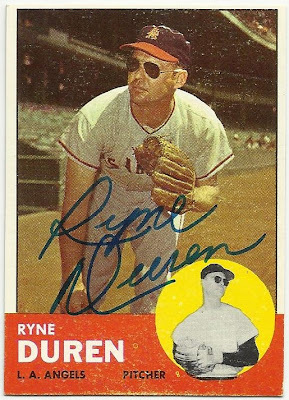 - Also played for the Twins (67-68); Royals (69-70); Pirates (71-73). - Regular shortstop for the expansion 1969 Kansas City Royals. - Won a World Series with the Pittsburgh Pirates in 1971. 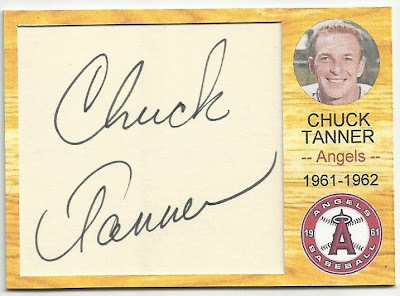 The Angels had 1 card in Series 1 and 3 in Series 2. The Angels have no patches in the Topps Update Series, which would have been the perfect opportunity for Topps to at least have an Angels patch from the 60's, the first decade of the Angels existance. 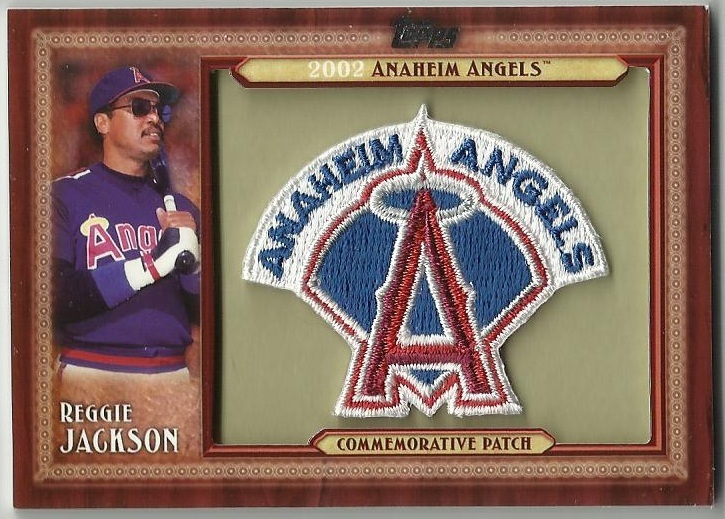 I don't understand the reasoning behind not matching up a player to the patch they would have worn. 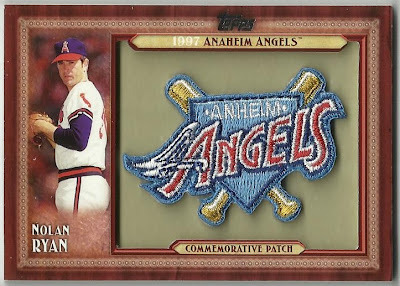 Nolan should have Hunters patch, Reggie should have Weavers patch. 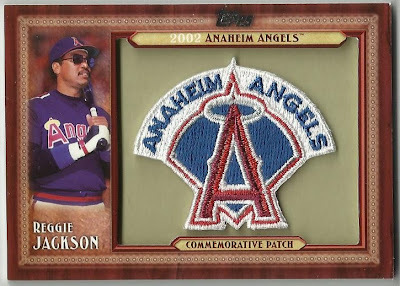 Or if it's a throwback patch then show the player in the throwback uniform that matches the patch. 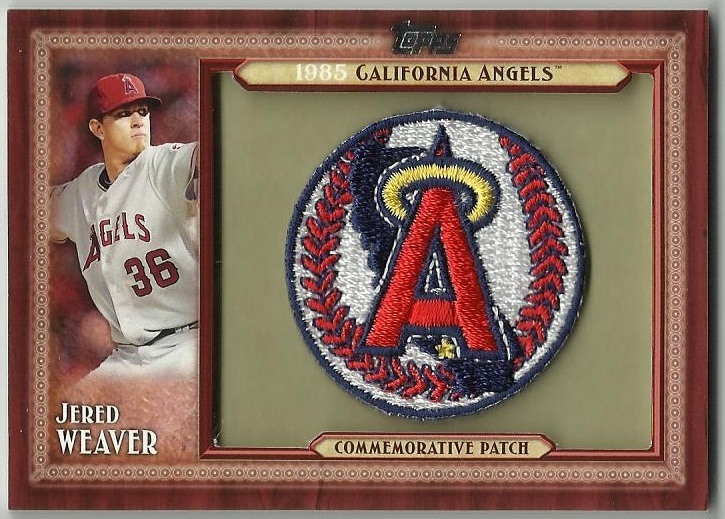 That would have worked great for Weaver and Hunter. 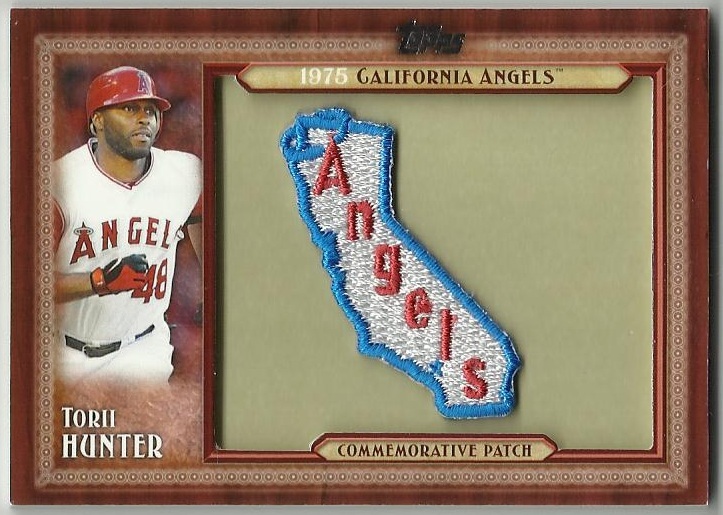 I dig these patch cards, but I think Topps missed the boat on this one. Merry Christmas fellow bloggers and readers! I appreciate you all and thank you all for your friendship. The more you send out, the more you get back. And if you do your research you end up not losing too many never to be seen again. I do my research and send only to guys with good return numbers. As I mentioned before I belong to sportscollectors.net. 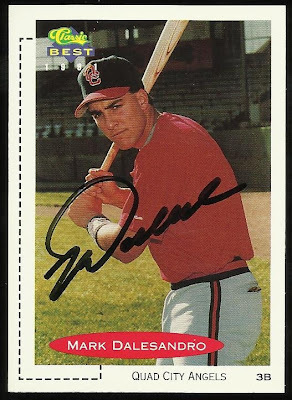 I had a bunch of these Talking SLU cards so I looked up who were good signers and sent a bunch out. Jerry Don Gleaton is a good signer and he also adds a Bible verse, something I don't mind at all. 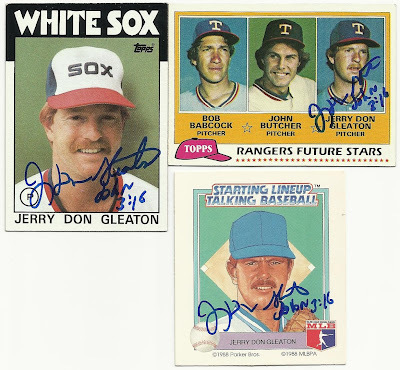 Mr. Gleaton signed these cards in 12 days. 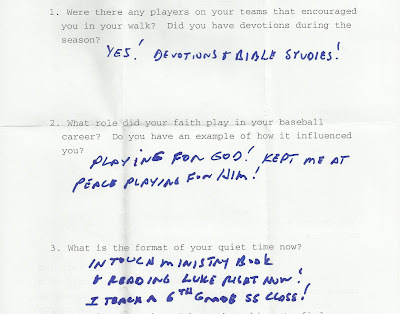 I asked him some questions about his faith. 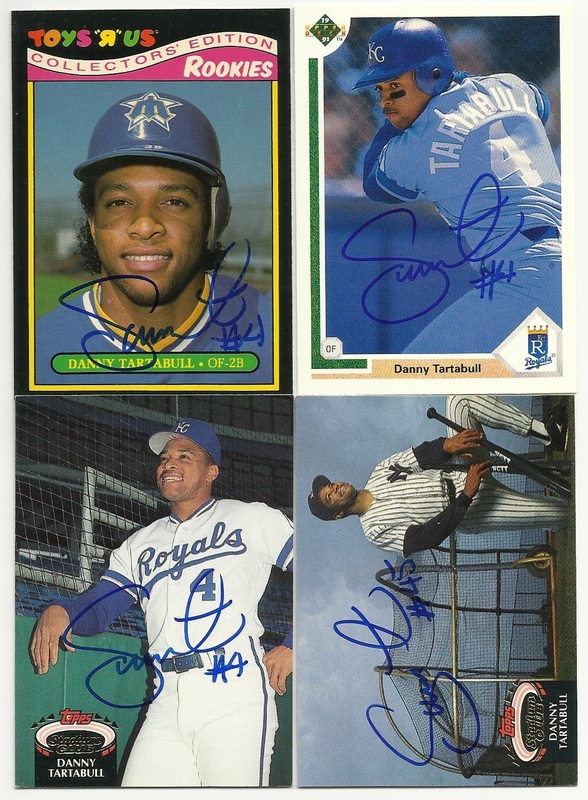 I saw recently on sportscollectors.net that Danny Tartabull had been signing stuff. I knew that he had cards in several sets I'm collecting so I took the chance to send him 4 cards. And it paid off. 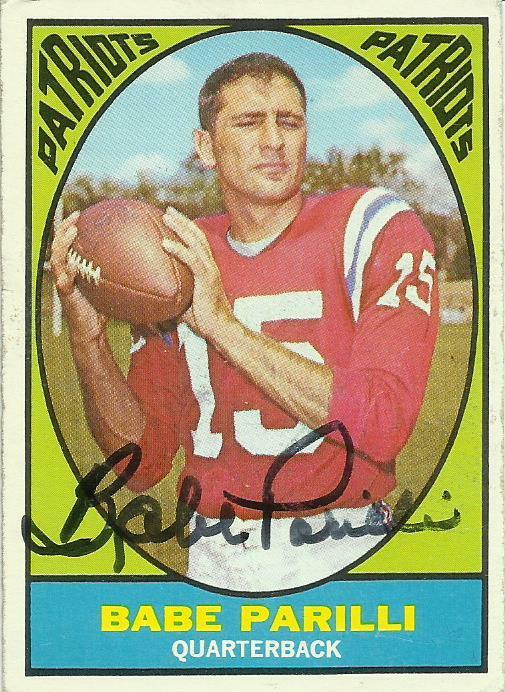 He signed all 4. 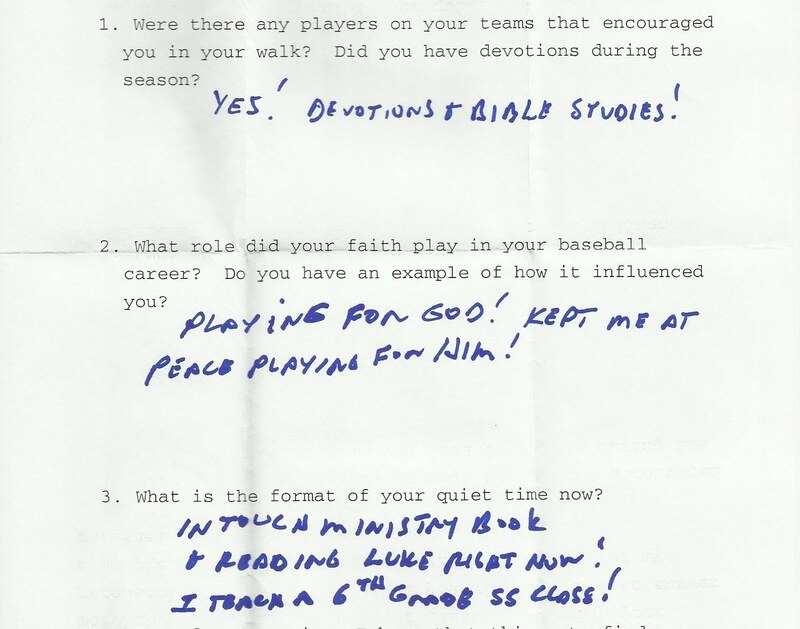 And, although brief, he did answer my questions. 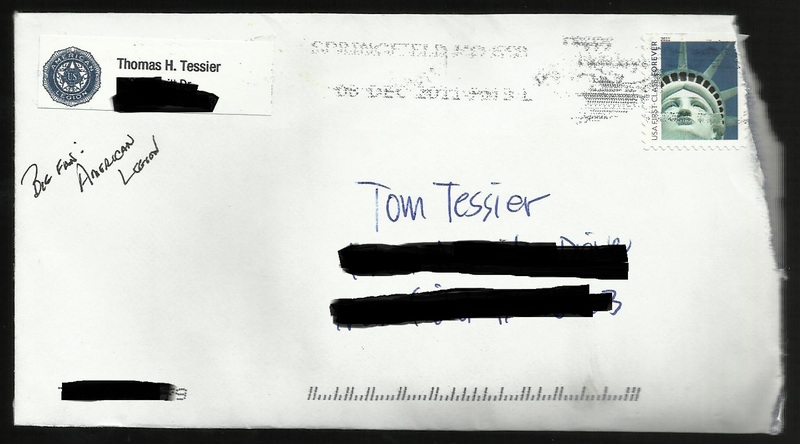 Returned after 35 days sent to his home in Agoura Hills, California. Ken Rowe took only 9 days to sign and return this 1965 Topps card. Sweet! He's a collector. 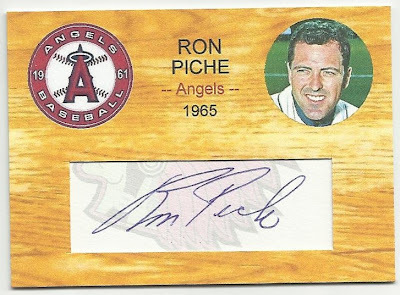 I wonder how he goes about collecting autographs...same as we do? 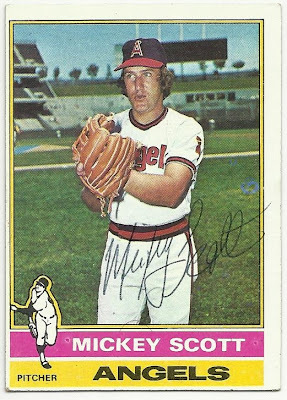 I'm sure he has a lot of connections inside baseball too. 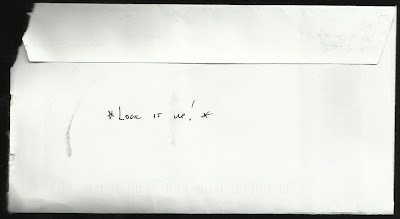 I'll have to write him again and ask him some questions about his collection. 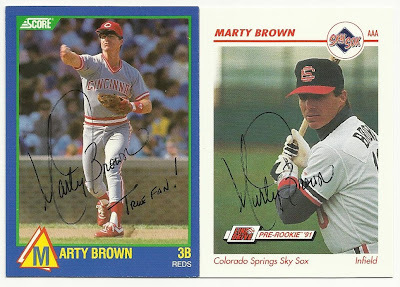 Marty Brown not only signed my cards and answered the questions but left some interesting comments along the way. Notice the "True Fan!" he wrote on the Score card. 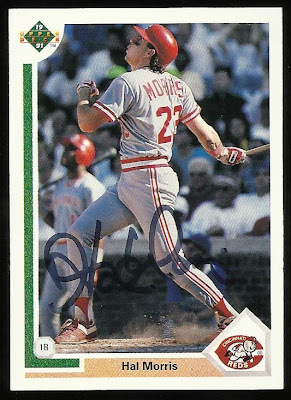 I wonder if (and hope) he's referring to me: maybe since I took the time to ask him some personal questions he knows that this is a personal hobby of mine, that I am genuinely interested and that I'm not in to sell autographs on ebay. My return address label has an American Legion logo. We get a sheet of address labels regularly from them since we've contributed before. 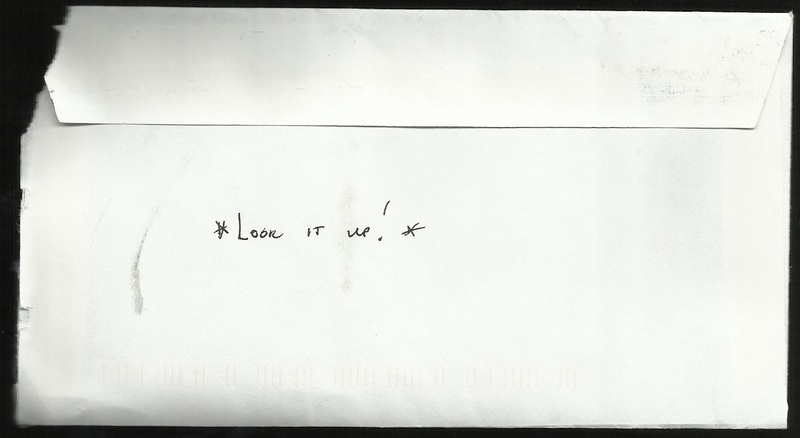 Mr. Brown wrote that he's a "Big fan: American Legion". Marty is the manager of the Las Vegas 51's the Triple-A affiliate of the Toronto Blue Jays. 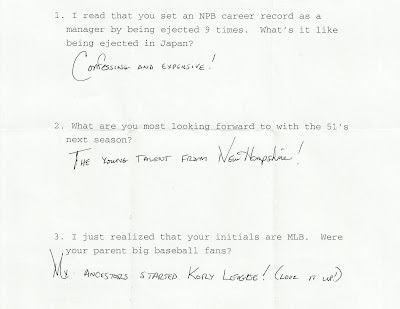 Not sure what he means by the "...talent from New Hampshire!" 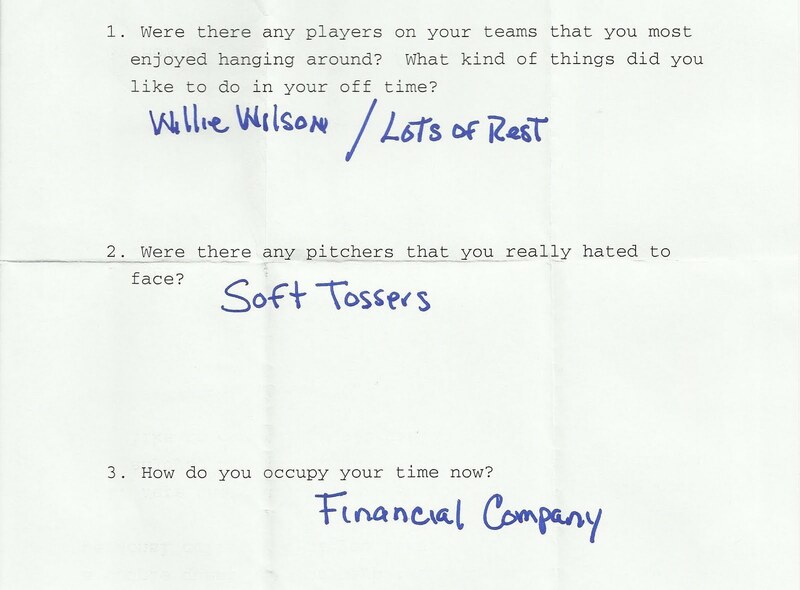 comment for question #2. Another answer that I didn't understand was that his "...ancestors started the Kory League.." He knew I wouldn't know what that was, hence his comment to "Look it up!" 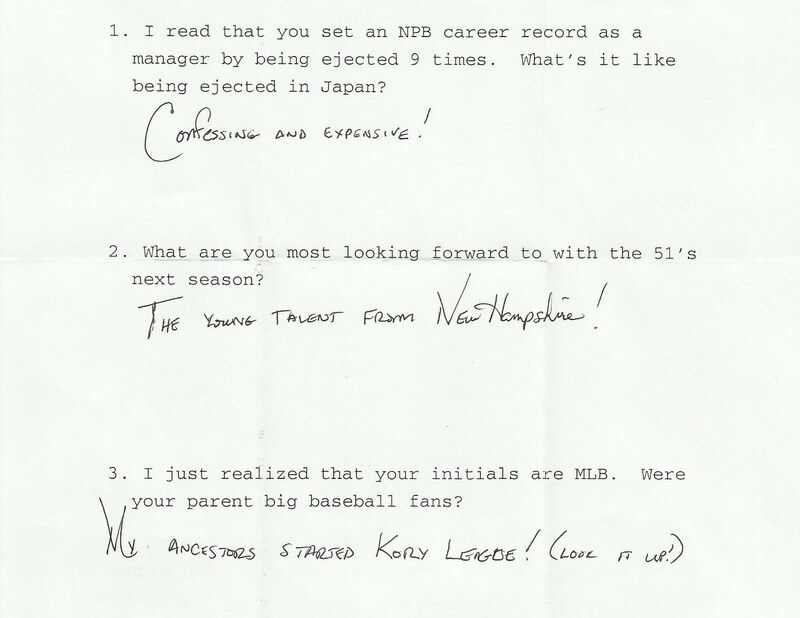 Well, I did look it up and still have no idea what the Kory League is. I was going through a box of well worn junk: mostly 1991 Topps, Donruss and Fleer baseball, 1991-92 football, and a scattering of basketball. I was getting ready to donate the shoebox but figured I'd go through it first just in case. What kinda card is this? What's that black box all about? I put my thumb on it thinking it was a heat sensative hidden image. Nope. 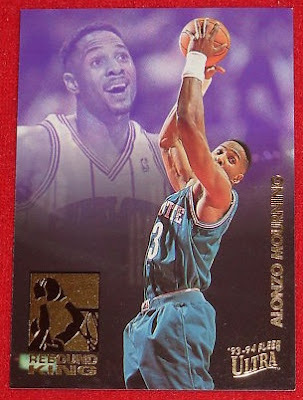 Then I turned the card over and realized it was a Fleer Ultra Rebound King insert card. 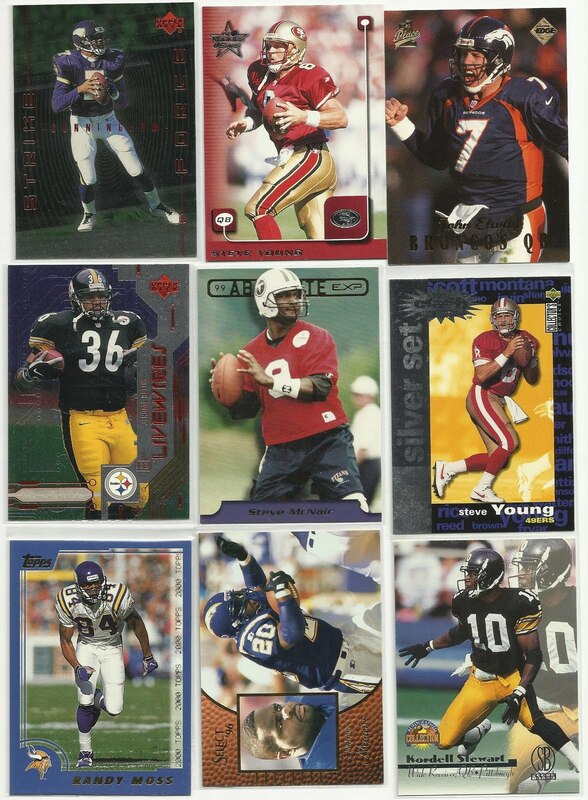 What do all Fleer Ultra have in common folks? Gold! There's no gold on the front. There's the error! 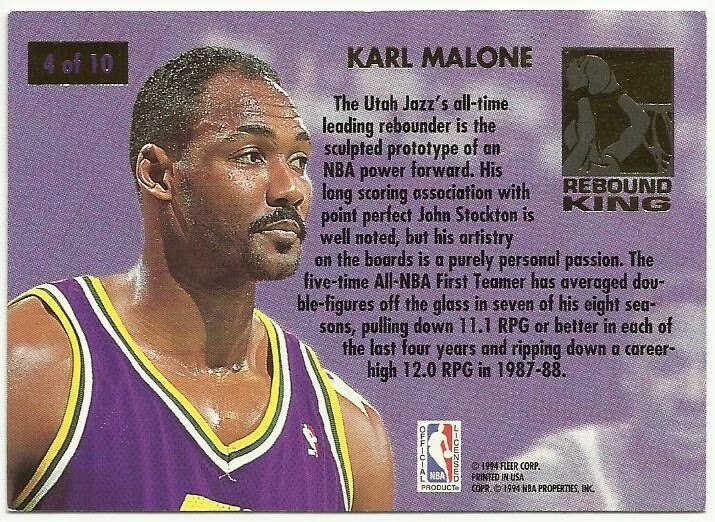 So, see all the gold that's missing from the Karl Malone card? 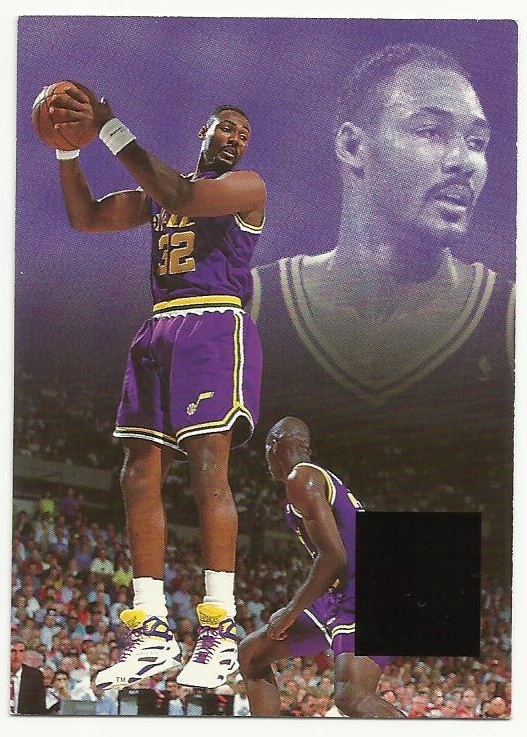 No gold Karl Malone, no gold 93-94 Fleer Ultra, and no gold Rebound King logo. Sweet. If you dig this card and want it for you collections of errors and variations, I posted it on sportlots. Please keep the wagering friendly. Jaybarkerfans Blog of the Year contest. Nominate someone you love. Win Prizes! 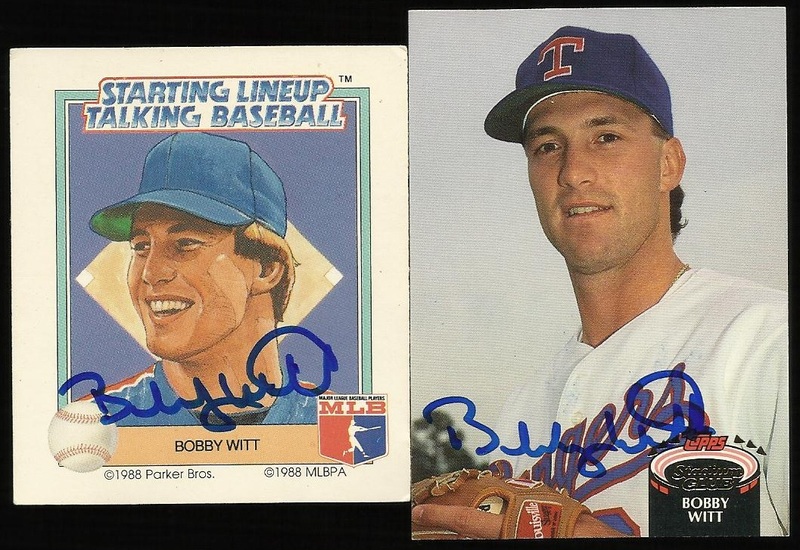 Former Ranger and local boy Bobby Witt signed this sweet little 1988 Kenner Starting Lineup Talking Baseball card and this 1992 Topps Stadium Club set card for me sent to his home in nearby Colleyville after 9 days. 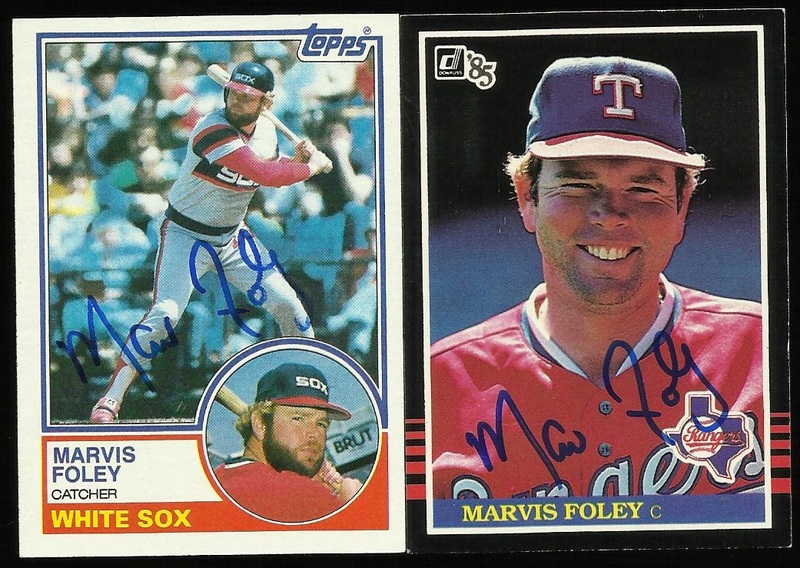 Another set card i needed was this 1983 Topps that Marvis Foley signed. 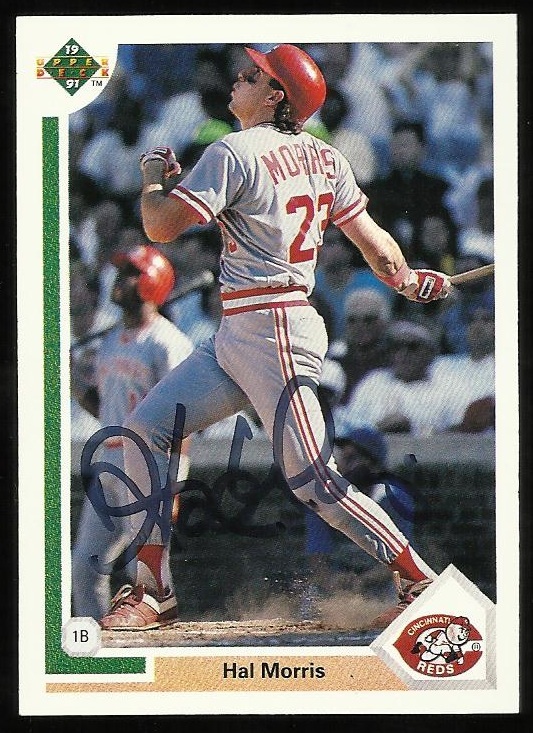 He also signed the '85 Donruss sent to his home in Bradenton, Florida in 9 days as well. 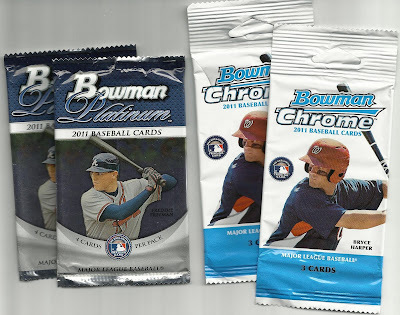 Justins Worlds own Justin saw a couple 2011 Bowman I recently picked up and asked about them. 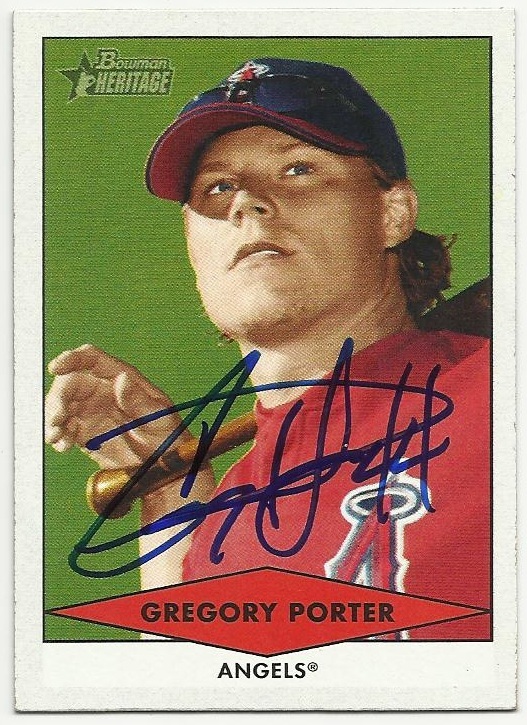 He had this signed 2007 Bowman Heritage Greg Porter card to offer, so I accepted. Two non-Angel Bowman for a signed Greg Porter Angel card...you bet! Mark Dalesandro signed 2 cards for me and graciously answered some hastily written questions after 49 days sent to his home in Plainfield, IL. 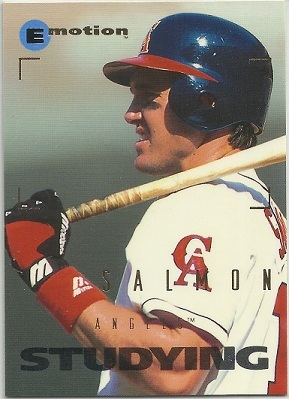 Mark played for the Angels in 1994 and 1995. 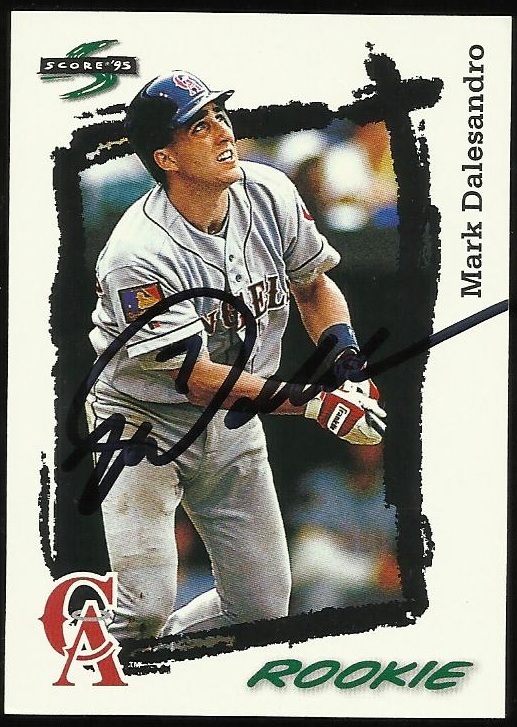 Were you up long before you made your debut against the Twins on June 6, 1994? "I was up about 3 days before my pinch hit against Larry Casian." "I was a little nervous but it was the greatest moment of my career. 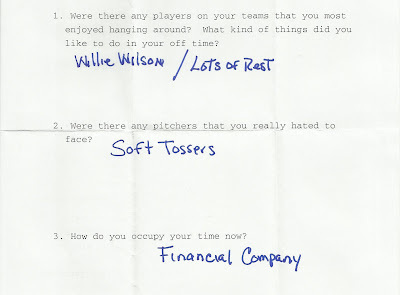 I had a lot of different emotions at the time." 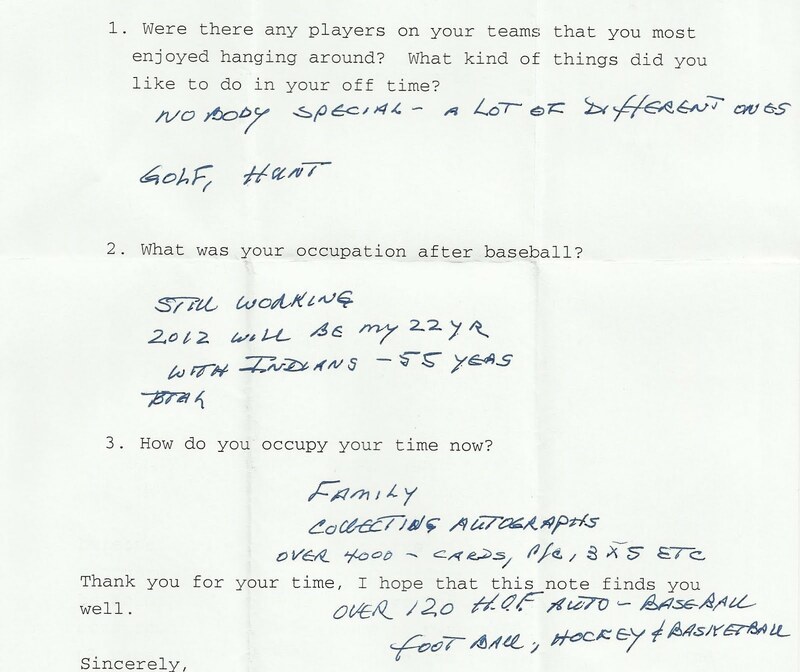 How did you prepare for "life after baseball?" 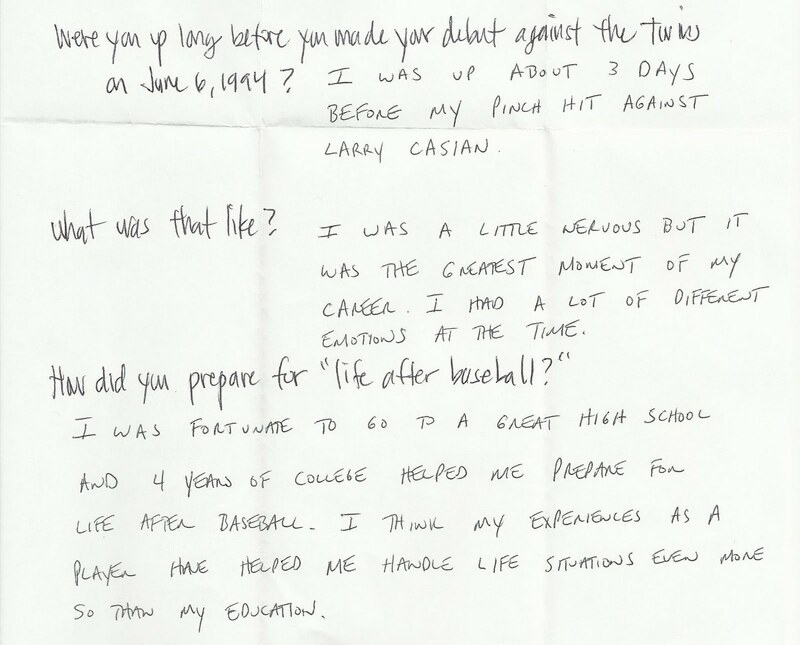 "I was fortunate to go to a great high school and 4 years of college helped me prepare for life after baseball. 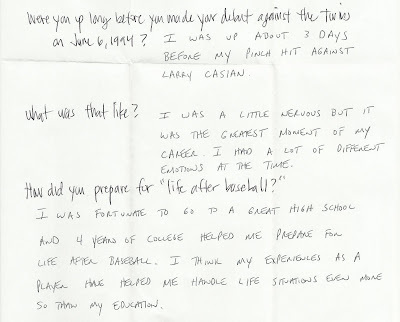 I think my experiences as a player have helped me handle life situations even more so than my education." I'm always thankful when a player answers my question, I'm especially thankful when they put an extra amount of effort into it. 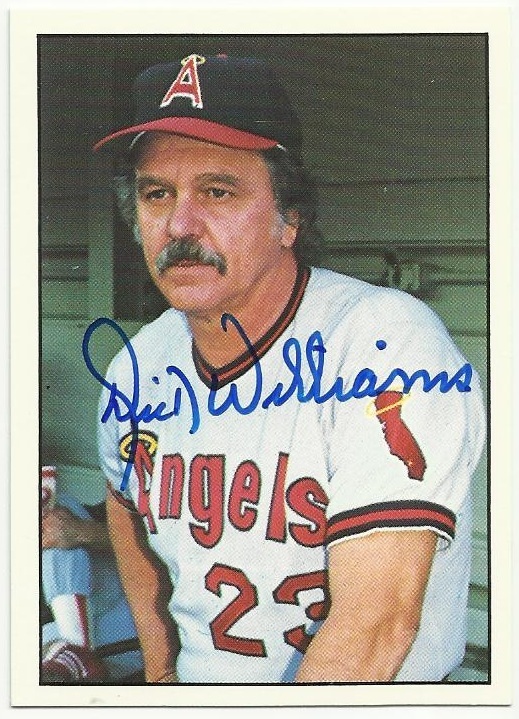 Hal Morris became the Angels new Director of Pro Scouting last month so I quickly shot a card, index card and letter to him at Anaheim Stadium. Thirty-five days later I get the 1991 Upper Deck set card back, no IC, and some answers to my letter. A faded thick black sharpie will do. Glad to have it and cross him off my 1991 Upper Deck set list and my All-Time Angels list. 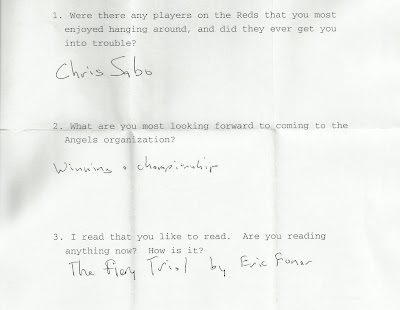 Oh how I wished he would have elaborated on the Chris Sabo answer. Is it safe to assume Sabo got him trouble too?